When you do a lot of stuff outside, you gets cuts, scrapes, and scratches. When you have kids, they get cuts, scrapes, and scratches, seemingly even if they’re in a padded room. During the summer, it’s rare if I don’t have some sort of minor skin wound or irritation, and of course, the kids can’t go more than a week without falling a scraping a knee. Needless to say, we’re frequently in need of first-aid attention (although it doesn’t always happen, because I don’t like to stop what I’m doing at the time). Neosporin is nice and all, but in keeping with the household theme, we try to cut back on our petroleum by-products and antibiotic use. 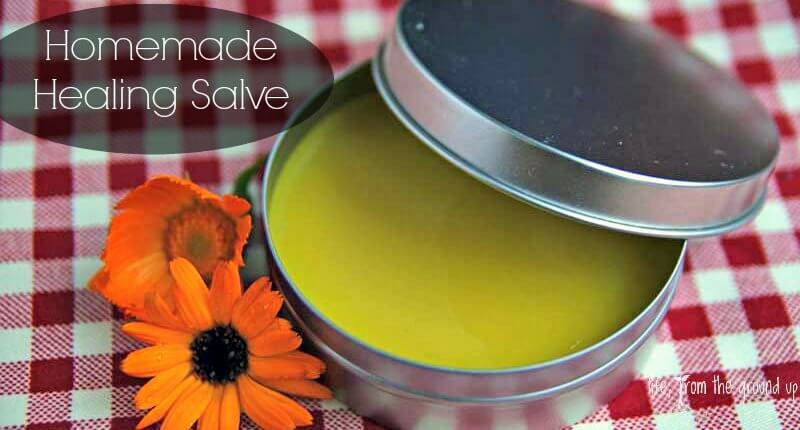 Since that’s out, what else are we to do but whip up our own healing salve? It’s 100% natural, effective, cheap, and almost everything comes from the backyard (I haven’t yet produced my own olive oil, which may be tough to do in Ohio, but don’t count me out yet). The key components are in the variety of botanicals used. I’ve recently started to grow a lot of beneficial plants, so I had plenty to choose from. Some good ones (that are also easy to grow or find already growing nearby) are calendula, plantain, St. John’s wort, comfrey, yarrow, echinacea, and chamomile, in any combination (you don’t have to use them all to be effective). All of these plants have various compounds that aid healing, reduce irritation, are antiseptic/antibacterial, or are just plain good for the skin. Start by infusing your herbs in oil (you can buy already-infused oils, but I’d generally recommend making your own). Put a bunch of flowers/leaves in a jar, then cover with oil. Ideally, you’d let this sit for a good month or so in a sunny windowsill or something along those lines. If you can’t do that, you can put the jars in a slow cooker with an inch or two of water, and let it sit on low (don’t cover) for several hours or overnight. Don’t try to do anything on the stove, because you’ll probably just end up deep-frying the herbs. Once you have your infused (strained) oils, you’ll melt them down with a bit of beeswax (I’d start with about an 8:1 oil-beeswax ratio; you can tweak it to make the salve firmer or softer) and pour into a jar or tin to cool; I prefer a tin because it’s wider and easier to get into. 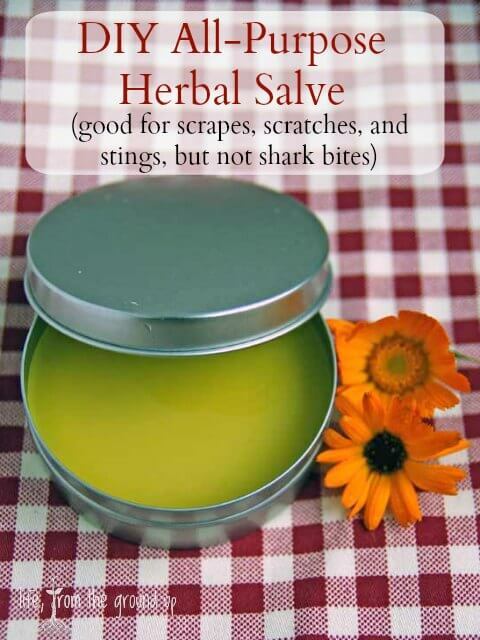 And that’s a healing salve for you. If you don't have infused oils on hand (and really, who doesn't just keep infused oils laying around?? ), you can make some by putting flowers/leaves in a jar with the oil and leaving in a sunny place for 3-4 weeks. Or, put the jar in an inch of water in a slow cooker on low overnight. In a double boiler (I just put everything into a glass measuring cup and put that on a rag in a pan of water), combine the oil and beeswax and gently heat until fully melted. Give a good stir to make sure it's completely mixed. Pour into a small jar or tin and let cool. Put a cute label on the tin. Seriously, use this stuff on anything; it truly is a healing salve. 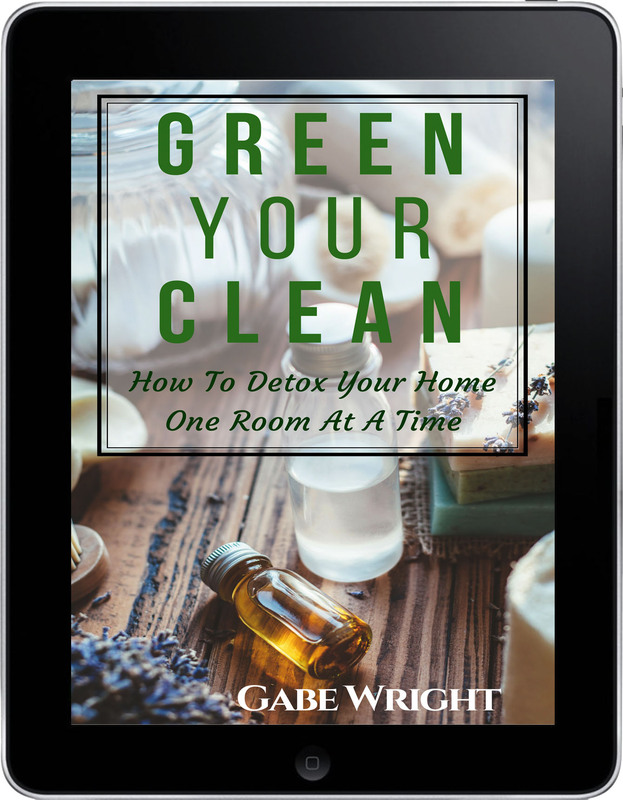 Are you looking to detox your home even more? Get this recipe plus 40 more for less than $10 – click here for more information!